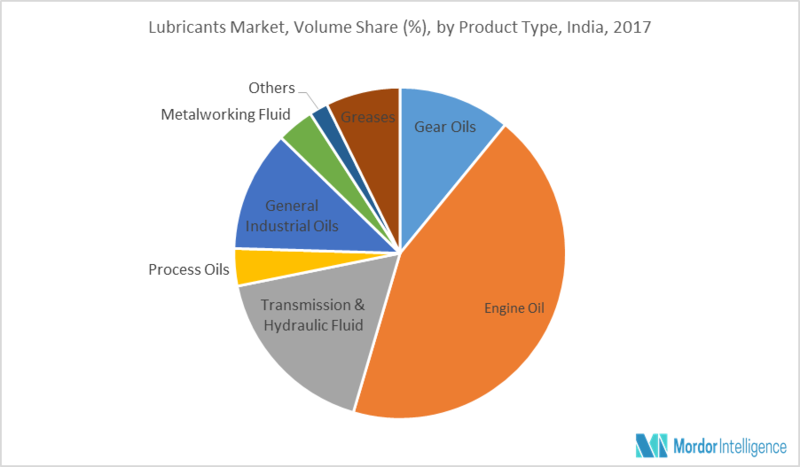 India Lubricants Market – Segmented by Product Type (Engine Oil, Transmission & Hydraulic Fluid, Metalworking Fluid, General Industrial Oil, Gear Oil, Greases, Process Oils), End-user Industry, and Geography– Growth, Trends, and Forecast (2018-2023). The India lubricant market is expected to register a CAGR of 4.64%, during the forecast period, 2018-2023. The major factors driving the growth of the market are the increasing vehicular production along with the growing industrial sector. The major driver for the India lubricant market is the boosting demand from the automotive industry. The sales of new motor vehicles in the country has been on a consistent rise, majorly owing to the growing middle class incomes. The automotive production in India has also been on a rising path with yearly growth rates of over 6%, thus, increasing the demand for engine oils and other lubricants employed in the automotive industry. Though, mineral oils hold the largest share among all the automotive lubricants used in the country, synthetic and semi-synthetic lubricants are expected to grow at a rapid pace during the forecast period. A great deal of demand growth for lubricants is expected from the construction and agriculture industries. Growing investments in the infrastructure sector and other strategic initiatives of the Government of India are expected to boost the construction sector in the country, which, in turn, is anticipated to boost the demand for the lubricants used in construction activities and other heavy equipment in India. October 2017 - Suzuki, India’s largest car manufacturer has launched Ecstar – its own brand of lubricants and coolants. 5.2.2 Automotive & Other trans.